In its early years, the program made only occasional forays into science fiction and fantasy. Notable exceptions include adaptations of Curt Siodmak's Donovan's Brain and H. P. Lovecraft's "The Dunwich Horror", but by the late 1950s, such material was regularly featured. On the second presentation of July 22, 1940, Forecast offered a mystery/horror show titled Suspense. With the co-operation of his producer, Walter Wanger, Alfred Hitchcock received the honor of directing his first radio show for the American public. The condition agreed upon for Hitchcock's appearance was that CBS make a pitch to the listening audience about his and Wanger's latest film, Foreign Correspondent. To add flavor to the deal, Wanger threw in Edmund Gwenn and Herbert Marshall as part of the package. All three men (including Hitch) would be seen in the upcoming film, which was due for a theatrical release the next month. Both Marshall and Hitchcock decided on the same story to bring to the airwaves, which happened to be a favorite of both of them: Marie Belloc Lowndes' "The Lodger." Alfred Hitchcock had filmed this story for Gainsborough in 1926, and since then it had remained as one of his favorites. In the earliest years, the program was hosted by "The Man in Black" (played by Joseph Kearns or Ted Osborne) with many episodes written or adapted by the prominent mystery author John Dickson Carr. 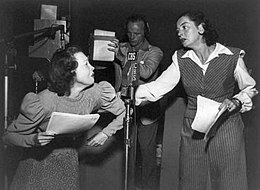 One of the series' earliest successes and its single most popular episode is Lucille Fletcher's "Sorry, Wrong Number", about a bedridden woman (Agnes Moorehead) who panics after overhearing a murder plot on a crossed telephone connection but is unable to persuade anyone to investigate. First broadcast on May 25, 1943, it was restaged seven times (last on February 14, 1960)—each time with Moorehead. The popularity of the episode led to a film adaptation in 1948. Another notable early episode was Fletcher's "The Hitch Hiker", in which a motorist (Orson Welles) is stalked on a cross-country trip by a nondescript man who keeps appearing on the side of the road. This episode originally aired on September 2, 1942, and was later adapted for television by Rod Serling as a 1960 episode of The Twilight Zone. The episode's primary plot device of a motorist being relentlessly pursued by a diabolical hitchhiker was also featured in the 1986 horror classic The Hitcher, with 18-year-old C. Thomas Howell assuming Welles's role as the young protagonist. After the network sustained the program during its first two years, the sponsor became Roma Wines (1944–1947), and then (after another brief period of sustained hour-long episodes, initially featuring Robert Montgomery as host and "producer" in early 1948), Autolite Spark Plugs (1948–1954); eventually Harlow Wilcox (of Fibber McGee and Molly) became the pitchman. William Spier, Norman MacDonnell and Anton M. Leader were among the producers and directors. Suspense received a Special Citation of Honor Peabody Award for 1946. The program's heyday was in the early 1950s, when radio actor, producer and director Elliott Lewis took over (still during the Wilcox/Autolite run). Here the material reached new levels of sophistication. The writing was taut, and the casting, which had always been a strong point of the series (featuring such film stars as Orson Welles, Joseph Cotten, Henry Fonda, Humphrey Bogart, Judy Garland, Ronald Colman, Marlene Dietrich, Eve McVeagh, Lena Horne, and Cary Grant), took an unexpected turn when Lewis expanded the repertory to include many of radio's famous drama and comedy stars—often playing against type—such as Jack Benny. Jim and Marian Jordan of Fibber McGee and Molly were heard in the episode "Backseat Driver", which originally aired February 3, 1949. The highest production values enhanced Suspense, and many of the shows retain their power to grip and entertain. At the time he took over Suspense, Lewis was familiar to radio fans for playing Frankie Remley, the wastrel guitar-playing sidekick to Phil Harris in The Phil Harris-Alice Faye Show. On the May 10, 1951 Suspense, Lewis reversed the roles with "Death on My Hands": A bandleader (Harris) is horrified when an autograph-seeking fan accidentally shoots herself and dies in his hotel room, and a vocalist (Faye) tries to help him as the townfolk call for vigilante justice against him. With the rise of television and the departures of Lewis and Autolite, subsequent producers (Antony Ellis, William N. Robson and others) struggled to maintain the series despite shrinking budgets, the availability of fewer name actors, and listenership decline. To save money, the program frequently used scripts first broadcast by another noteworthy CBS anthology, Escape. In addition to these tales of exotic adventure, Suspense expanded its repertoire to include more science fiction and supernatural content. By the end of its run, the series was remaking scripts from the long-canceled program The Mysterious Traveler. A time travel tale like Robert Arthur's "The Man Who Went Back to Save Lincoln" or a thriller about a death ray-wielding mad scientist would alternate with more run-of-the-mill crime dramas. The series expanded to television with the Suspense series on CBS from 1949 to 1954, and again in 1962. The radio series had a tie-in with Suspense magazine which published four 1946–47 issues edited by Leslie Charteris. The final broadcasts of Yours Truly, Johnny Dollar and Suspense, ending at 7:00 pm Eastern Time on September 30, 1962, are often cited as the end of the Golden Age of Radio. The final episode of Suspense was Devilstone, starring Christopher Carey and Neal Fitzgerald. It was sponsored by Parliament cigarettes. THE MAN IN BLACK: Suspense! This is The Man in Black, here again to introduce Columbia's program, Suspense. Our stars tonight are Miss Agnes Moorehead and Mr. Ray Collins. You've seen these two expert and resourceful players in "Citizen Kane" – "The Magnificent Ambersons" in which Miss Moorehead's performance won her the 1942 Film Critics' Award. Mr. Collins will soon be seen in the Metro-Goldwyn-Mayer Technicolor film, "Salute to the Marines." Miss Moorehead and Mr. Collins return this evening to their first love, the CBS microphone, to appear in a study in terror by Lucille Fletcher called "The Diary of Sophronia Winters." THE MAN IN BLACK: ... Suspense! Suspense was inducted into the National Radio Hall of Fame in 2011. The familiar opening phrase "tales well-calculated to..." was satirized by Mad as the cover blurb "Tales Calculated to Drive You... Mad" on its first issue (October–November 1952) and continuing until issue #23 (May 1955). Radio comedians Bob and Ray had a recurring routine lampooning the show called "Anxiety." Their character Commander Neville Putney told stories that were presented as dramatic but were intentionally mundane, with the opening line "A tale well designed to keep you in... Anxiety." For the Poway Performance Art Company, the 70-year-old San Diego actor-director Robert Hitchcox mounted a 2006 stage production recreating Suspense, complete with commercials, in a stage set designed like a CBS radio studio. July 22, 1948 Deep Into Darkness Douglas Fairbanks Jr. In 2012, John C. Alsedek and Dana Perry-Hayes of Blue Hours Productions revived Suspense for Sirius XM Radio, recording all-new scripts including originals and adaptations of works by the likes of H.P. Lovecraft, Cornell Woolrich, and Clark Ashton Smith. The Suspense revival is currently airing on nearly 250 radio stations worldwide, and has been nominated for a Peabody Award. Season One is also available as video on YouTube. Season Two is under production, with episode #25 slated to premiere March 1, 2015. For more information on the Suspense revival, please visit www.bluehoursproductions.com. Since 2007, Radio Classics, on Sirius XM channel 82, has been airing episodes of Suspense in its daily lineup among other classic shows, such as The Whistler, The Mysterious Traveler, and The Hermit's Cave. The show is also streamed nightly at 7 pm Pacific time on kusaradio.com from the original masters. ^ "New 'Suspense' Series" (PDF). Broadcasting. January 5, 1948. p. 36. Retrieved 22 March 2017. ^ "Peabody Awards for '46 Announced" (PDF). Broadcasting. April 21, 1947. Retrieved 26 September 2014. ^ "Those Were the Days". Nostalgia Digest. 38 (3): 39. Summer 2012. ^ Suspense, April 27, 1943. ^ "Suspense". National Radio Hall of Fame. Retrieved 5 January 2016. ^ PowPAC: "Wrong Number & the Hitch-hiker"
^ a b c d e f g h "Those Were the Days". Nostalgia Digest. 38 (3): 32–39. Summer 2012. ^ Elliott, Jordan (Summer 2012). "Suspense!". Nostalgia Digest. 38 (3): 42–49. ^ a b "Those Were the Days". Nostalgia Digest. 35 (2): 36. Spring 2009. ^ "(photo caption)". New York, Brooklyn. The Brooklyn Daily Eagle. January 4, 1943. p. 8. Retrieved January 6, 2016 – via Newspapers.com. ^ "Those Were the Days". Nostalgia Digest. 37 (4): 34. Autumn 2011. ^ a b "Those Were the Days". Nostalgia Digest. 42 (1): 32. Winter 2016. ^ "Dinah Offers Good Variety". Illinois, Decatur. The Decatur Daily Review. January 6, 1944. p. 13. Retrieved January 6, 2016 – via Newspapers.com. ^ "Bruce, Joslyn". Ohio, Circleville. The Circleville Herald. January 25, 1944. p. 7. Retrieved January 6, 2016 – via Newspapers.com. ^ "Story of Twins". Maryland, Cumberland. The Cumberland News. February 3, 1944. p. 11. Retrieved January 6, 2016 – via Newspapers.com. ^ "Viva America Offers Evelyn". Illinois, Decatur. The Decatur Daily Review. February 10, 1944. p. 15. Retrieved January 6, 2016 – via Newspapers.com. ^ "Decatur Game On Air at 9:30". Illinois, Decatur. The Decatur Daily Review. March 9, 1944. p. 15. Retrieved January 6, 2016 – via Newspapers.com. ^ "'Suspense' Guest". Pennsylvania, Harrisburg. Harrisburg Telegraph. April 1, 1944. p. 15. Retrieved January 6, 2016 – via Newspapers.com. ^ a b c "Those Were the Days". Nostalgia Digest. 41 (2): 33. Spring 2015. ^ a b "Those Were the Days". Nostalgia Digest. 42 (2): 33. Spring 2016. ^ a b c "Those Were the Days". Nostalgia Digest. 37 (1): 33. Winter 2011. ^ "Those Were the Days". Nostalgia Digest. 42 (2): 32. Spring 2016. ^ a b "Those Were the Days". Nostalgia Digest. 43 (2): 39. Spring 2017. ^ "Radio's Golden Age". Nostalgia Digest. 41 (2): 40. Spring 2015. ^ "Those Were the Days". Nostalgia Digest. 40 (1): 32. Winter 2014. ^ "Radio's Golden Age". Nostalgia Digest. 38 (3): 40–41. Summer 2012. ^ a b c "Those Were the Days". Nostalgia Digest. 41 (3): 32–39. Summer 2015. ^ "Those Were the Days". Nostalgia Digest. 42 (4): 35. Autumn 2016. ^ a b "Those Were the Days". Nostalgia Digest. 39 (1): 32–39. Winter 2013. ^ "Those Were the Days". Nostalgia Digest. 37 (4): 33. Autumn 2011. ^ "Radio's Golden Age". Nostalgia Digest. 39 (1): 40. Winter 2013. ^ "Radio's Golden Age". Nostalgia Digest. 37 (4): 41. Autumn 2011. ^ a b "Those Were the Days". Nostalgia Digest. 40 (2): 33. Spring 2014. ^ "Those Were the Days". Nostalgia Digest. 38 (4): 38–39. Autumn 2012. ^ "Those Were the Days". Nostalgia Digest. 42 (3): 34. Summer 2016. ^ "Those Were the Days". Nostalgia Digest. 40 (2): 32. Spring 2014. ^ "RadioClassics (Ch. 148 on Sirius & XM) gregbellmedia.com, April 30th - May 6th, 2017". ^ "Those Were the Days". Nostalgia Digest. 43 (4): 32. Autumn 2017. ^ "Those Were the Days". Nostalgia Digest. 42 (4): 36. Autumn 2016. ^ "Those Were The Days". Nostalgia Digest. 44 (1): 32. Winter 2018. ^ "Radio's Golden Age". Nostalgia Digest. 39 (2): 40–41. Spring 2013. ^ "Those Were the Days". Nostalgia Digest. 37 (4): 38. Autumn 2011. ^ "Those Were the Days". Nostalgia Digest. 37 (4): 39. Autumn 2011. Wikimedia Commons has media related to Suspense. OTR Plot Spot: Suspense – plot summaries and reviews.